Ilva first brought up the idea for Heart of the Matter to me last March, when I wrote this post. Back then, it didn’t have a name and was just an idea being tossed around between blog friends - something to try, to put out there for the world to find, and to see what happened. Back then, I was smack in the middle of ramping up to finish my degree and trying find some semblance of balance in my life, so we kept putting it off until a day “when I wouldn’t be quite so busy” (ha ha ha). Unfortunately, my life just kept getting busier and busier...the actual writing of my dissertation began, I was planning a wedding, and trying to apply for future jobs. So when she told me about Joanna - and who more perfect to carry this idea forward than someone who had experienced the devastation and lifestyle changes that a brush with heart disease requires (read Joanna’s story here) - I told them to go ahead without me, with hopes that I would be able to join them later. Between the two of them, these lovely ladies have turned this little idea into a true force – a resource for those of us seeking heart-healthy recipes and a healthy lifestyle while maintaining a focus on delicious and interesting food. The site is filled not only with helpful links, thoughts and recipes, but also encouraging words and a sense of community, providing a forum to discuss the ever-present threat of this rapidly growing disease. 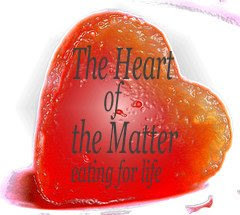 And I, dear readers, am lucky enough to be able to join with them now as host for November’s Heart of the Matter – Eating for Life (HotM 9). With the all of the many holidays coming up in the next few months: Thanksgiving, Christmas, Hanukkah, Boxing Day, St. Andrews Day, or whatever other holiday(s) you may celebrate in the upcoming months, we decided that it would be good to get recipes together early so that we would have heart-healthy alternatives (or additions) to our normal holiday fare. So the theme for November will be: Holiday Food. What do you think of when you think of holiday foods? I think of family recipes – for Thanksgiving in the U.S., what comes to mind is the crisp skin of a roasted turkey, sweet potatoes studded with tiny marshmallows and sitting in a pool of real maple syrup, gooey and cheesy artichoke dip, sweet-tart cranberry sauce and tender, moist stuffing - nearly all of it dripping with butter, full of cholesterol and fat or sugar. In December, as Christmas grows nearer, there is spiked eggnog, homemade Christmas cookies and indulgent mincemeat pies. There has to be equally delicious alternatives to some of these treats – let’s make them so that we can enjoy them without feeling guilty, and knowing that we’re doing a good thing for the hearts of our loved ones as well as our own. Whatever the holidays you’ll be celebrating, think about the food you’d like to have then. Can you re-work an old holiday family favorite to make it heart-healthy? Do you have Christmas treats that you like to give as gifts (for what better gift than the gift of health?)? Do you have a seriously good rendition of a classic holiday dish that just happens to be good for you, or have you spent long hours perfecting one? Why not share it with us all? And while you’re at it, if you’d like to, tell us a little bit about the holiday you’re cooking for and what it means to you. You can start submitting your entries as soon as you’d like – simply send me the link to your entry at my email address (mphilli4 AT uoregon DOT edu) by November 18th. This is a little earlier than the usual deadline (the 23rd), but since Thanksgiving is on the 22nd for those of us in the U.S., I’d like to get them rounded up for you by the 20th in case there are Thanksgiving recipes so you still have time to run to the store when you see that perfect heart-healthy recipe you’d like to bring to your own table. Plus, having all the recipes in by this time, especially Christmas recipes, leaves us already prepared with healthy menus as those busy holiday days encroach when we’re strapped for time between shopping and eating and holiday parties (Ilva will be hosting a fabulous theme full of quick and easy recipes for HotM in December, just to make sure we all have a repertoire of heart-healthy foods to use as a defense against those nights when we’re exhausted from running back and forth to and from just such occasions). In your post, make a link to my site, The Accidental Scientist, or to the HotM site if you’d like, so that your readers can find the event and see the round up when it comes out. If you’re new to this (like I am! ), the rules to eating a heart-healthy diet are nicely laid out in Joanna’s Basic Rules, and we ask that you consider this as a one-entry event, ie. that you don’t use your entry for other events as well. Feel free to browse the other recipes on the HotM site for inspiration if you’d like – we can’t wait to see what you have to share! Michelle, Joanne, what about scallops? Are they allowed? I leave it up to you to decide whether scallops would be fit. I'm going to try a few things with them. I hope you don't mind if I answer and not the other two, I have made some research and scallops are fine so go for it! Ilva, ok, thank you! I will post. I'd love to participate and wonder if it's okay to use your HotM image in my sidebar (I have a "current blog events" section) with a link back to this post? Of course it's OK, we're just happy if you want to help spreading the word! Thanks! Done! Looking forward to working on my entry! Yikes! Sorry I missed all your comments - I checked at the beginning and then forgot to keep checking here!! Thanks for answering everyone's questions, Ilva - I'll do better next time! !